Behind this bike silhouette is a colorful, one-of-a-kind array of reclaimed wood, bike chain, and inner tubes. Behind every great bike ride is a unique story of weather, gear, and road conditions. Behind this bike silhouette is a colorful, one-of-a-kind array of reclaimed wood, bike chain, and inner tubes. Sections of this contrasting collage peek through the birch wood silhouette in a dynamic dialogue of shapes and surfaces. 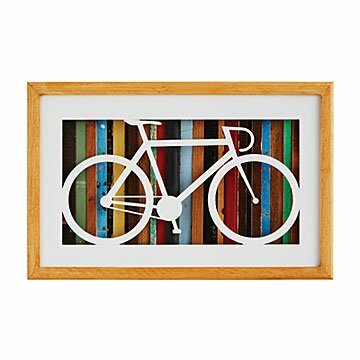 It makes a great gift and conversation starter for any bike enthusiast with an eye for road-worthy art. All materials locally sourced and handmade by Marco Facciola and Stephen Washer in Montreal, Canada, home to hundreds of kilometers of bike lanes, paths, and trails. Read more about Marco, Stephen, and their creative process on the blog. Marco Facciola and Stephen Washer believe that every piece of recycled material has a fascinating story that they incorporate into their art. These cousins from Montreal share a great passion for woodworking and recycling. Growing up together, they constantly came up with new projects and spent countless hours creating and getting their hands dirty. The inspiration for their silhouette compositions came when they made a wooden silhouette representing a large home renovation project that incorporated all the old materials from the house. From there, Marco and Stephen began creating a variety of wooden silhouette art from recycled materials. They use the colors, textures, and depth of recycled wood, ropes, hockey sticks, and other reclaimed material to bring their silhouettes to life. Visit the blog to learn more about Marco and Stephen's recycled creations. Hang on wall with secured nail or screw. Such a neat gift for a bike lover! It is so neat that the artist used an actual bike chain and tire in the design. It makes the piece so special. The custom wood art is eye catching and beautifully made. The white bike in the foreground stands out with the multi-color wood strips in the background. It is indeed a mesmerizing work of art.